KATIE: Don't you think it's got something to do with that eye patch of yours? KATIE: Anything for the ladies. WAFFLES: Uh, Boss... speaking of ladies, your lady-beard is crooked. WAFFLES: What about beads on beards? Can I tell you the beads on your beard are crooked? Because they're crooked. KATIE: Careful, Waffles. Or I'll make you walk the plank. KATIE: I said walk the plank, Waffles. Not dance on it. KATIE: Petty sure pirates don't listen to the BeeGees. 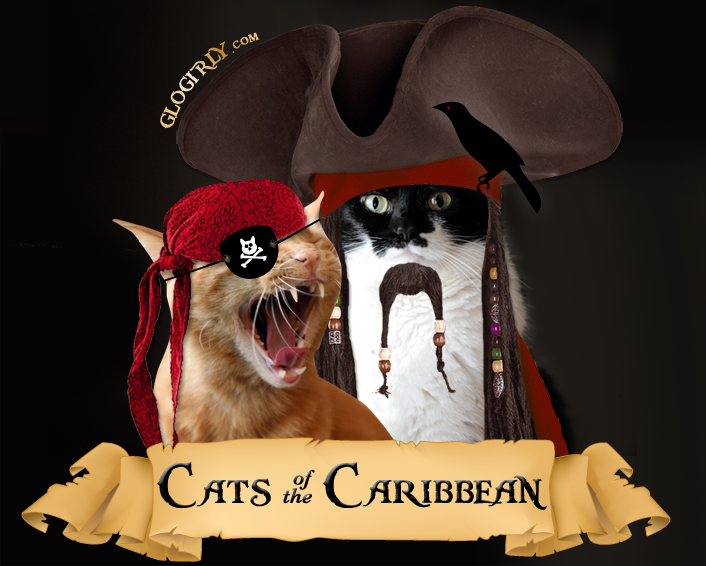 It's International Meow Like a Pirate Day! We couldn't resist an opportunity for Katie to show off her Captain Jack Sparrow costume. And for Waffles to break into song and dance. Today's post is a throwback to our TV and Movie Spoof Series. We love the posts from this series so much and plan on bringing them back to life every once in a while. You made me laugh like a pirate. Any time Waffles gets to dance for his ladies! Waffles, I love ya dearly, but Katie ROCKS the pirate look today! Arrr! Ye be funny pirates! Ahoy Mateys...ye be pawsome pirates! Hee! Repeats like this are always welcome! ARRR, matey! What? Why can't you sing Bee Gees songs while dancing on a plank? 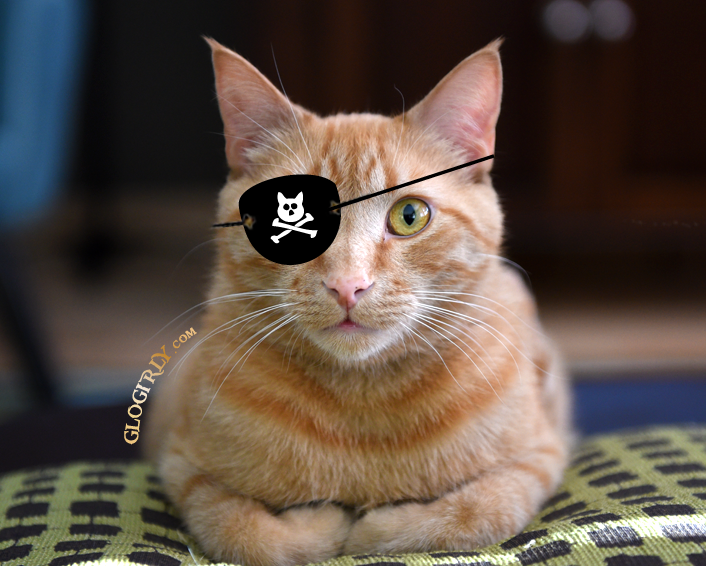 Happy Meow Like a Pirate Day, pals. Miss you! 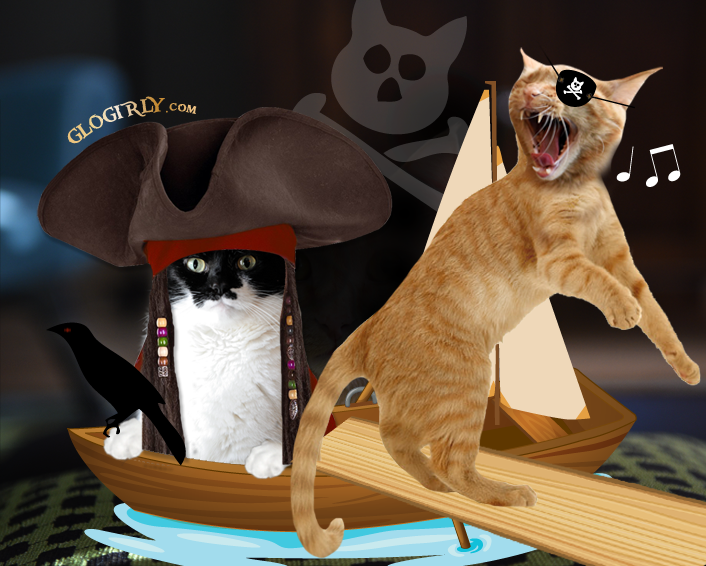 Thems some pawsome pirates matey!